DNA Yamaha FZ-07 / MT-07 Air Filter adds horsepower while letting your sportbike breath better. The efficiency of DNA Filters maximizes breathable surface area compared to the OEM filters allowing you to get the most horsepower on any track day event. • Installation of this DNA Air filter is very easy, simply follow the installation instructions included in the YAMAHA workshop manual. • The filtering efficiency is extremely high at 98-99% filtering efficiency (ISO 5011), with 4 layers of DNA Cotton. 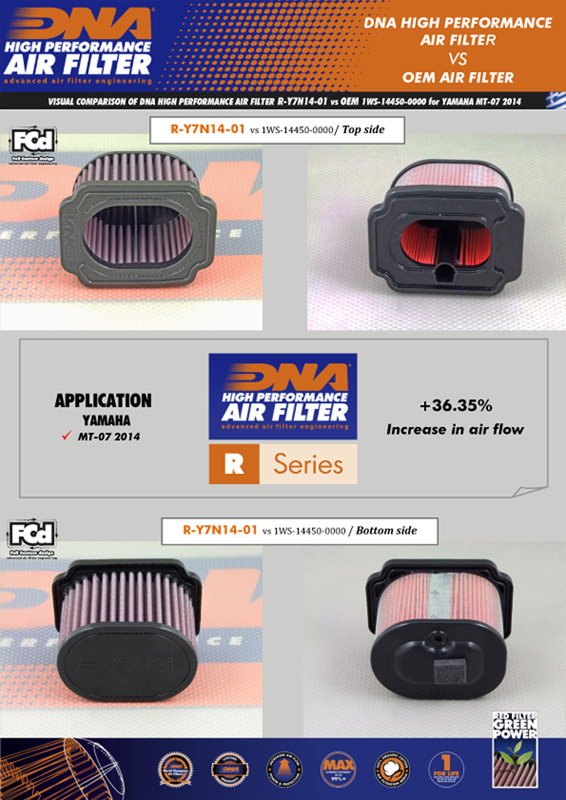 • The DNA filter has a 36.35% higher airflow than the Yamaha stock paper filter! • DNA air filter flow: 111.40 CFM (Cubic feet per minute) @1,5"H2O corrected @ 25degrees Celsius. • YAMAHA stock paper filter: 81.70 CFM (Cubic feet per minute) @1,5"H2O corrected @ 25degrees Celsius. • This DNA filter is designed as a High flow filter for Road, Off road and Track use. .
Click the button below to add the DNA Yamaha FZ-07 / MT-07 Air Filter (2014+) to your wish list.